This is the story of my first attachment to a place. I have a spacious yard or area around my house. When I was a child, I grew up with my elder brother as my playmate in the house. We often playedPlaystation together until we forgot about time whenever my brother bought a new game. Actually, I never got turn to play but just watching him on his joystick was already exciting. The reason he forbid me from touching the joystick was that I am still a kid who knows nothing, apparently, he was afraid that I would break his precious item. Soon, I grew bored of it so I played outside more often. Unsure of what activity I wanted to do, I wandered around the yard with my bicycle while singing Gita Gutawa’s song. I went round and round, enjoying how the wind was caressing my face and hair. When my feet were about to get hurt from too much pedaling the bicycle, my father asked me to follow him to the fishing pond behind my house. I rarely came there because of the rumor that people often found something scary within that area, either it was a voice or in a form of a woman. Just with the thought of it, I already got goosebumps but my father was waiting for me to follow him to the pond. We needed to walk in a straight way for about 25 steps, then the ponds were on left and right. My family owned the pond on the right side with a big mango tree. The location of the pond was near a paddy field, a tennis court, and the back side of the hospital. It was usually quiet there when no one played tennis. My father apparently liked the calming atmosphere and decided to fish there whenever he had free time. There was a chair made from the log which we used as a chair. The log’s surface was not smooth, the small part of the wood often got stuck in my pants. The water of the pond was so murky that I did not expect to see any fish below the water and for my father to catch a fish. The area smelled like nature, a good combination of the aroma of grass, tree, and water. A refreshing and clean air to be inhaled. The sound of cicadas and crickets filled my ears. Before my father set up his fishing rod, he went back to the garage to fetch a small hoe. Turned out, he looked over the area near the pond to find a mushy soil with worms inside. I joined him and able to collect some worms with my own hand. Then, we prepared the hook with worms as the fish bait. When he about to throw the hook, he offered me to throw it instead. It was my first time to touch a fishing rod. The item felt heavy as if it was full of a burden to catch a lot of fish. The wire of the rod quickly vanished below of the water. Slowly it went deeper as time tickling. I could not wait to catch my first fish. I wanted to show it to my mother too. While waiting for the fish to eat the worm, my father and I talked about that area more. My father told me that the area would be changed, sooner or later. The tennis court near the fishing pond was going to be demolished because the hospital urgently needed extra space for a new parking area. At that time, I listened half-heartedly because my focus was on the end when the fishing line met the water. Not long after the contest staring battle with the surface of the water, something bit the worm down. I pulled the handle and rolled the reel only to find a fish on the end of the hook. I was so happy that I was able to catch a fish for the first time. I asked my father to release it because I was afraid the fish would bite my finger, its scale was also slimy and slippery. I felt so happy to finally able to catch a fish on my own even though the size of the fish was not that big. Throughout the day, we were both so happy and my father laughed whenever I panicked or screamed because the fish would not stay still. In an instant, I got addicted to fish at the pond. After I came back from school, I put away my bag, changed my clothes quickly so that I able to spend most of my time there. There were many days when I decided to come here alone, without my father. Somehow, I grew attached to this pond. All bad thought I had about this before long gone, I understood why my father liked to be here. It was indeed a peaceful place, the ambiance made me want to stay there, enjoying nature. There was a time when I forgot to tell my mother about my whereabouts and she was looking for me until she had to call all my friends. When she found me, she quickly wanted me to go home and stay in the house. I was confused and thought my mother did not like me to go to the fishing pond anymore. I did not go back there for a few days because I did not want to make my mom angry, but my father asked me to join him again. Conflicted, I decided to just go with my father. I was not alone, so my mother would not mad at me right? Turned out, we got so many fishes that day, was it because I did not go there for a few days that this place was grateful for me to be back? Until suddenly, one day the fishing pond was being closed and people gathered there to fetch the fish with their own hand. The construction of the tennis court was happening too. There were many people and the place became different in my eyes. Too many strangers and men with a big body who made me scared. There went the peaceful atmosphere, the green grass also covered by mud and cement, and the area smelled very fishy. The big truck contained rock, sand, and cement also passed in front of my house every day to deliver the building material. The area around my house felt so busy. I did not like the situation at all so I decided to go back to the house and joined back my brother with his Playstation. I confronted my father, as of why the pond needed to be demolished too. It was my favorite place at that time. My father said it was because he was afraid the waste from the construction would be thrown away into the pond which would make the fish to be killed. It was better for the fishes to be collected alive rather than later when they already dead. He could not do anything too because he did not have a right to voice out his opinion in the plan of demolishing the pond. I wanted to go back fishing at the pond, but I could not do anything. Often times I stayed in a gazebo quite near the empty pond, not looking particularly at anything but the difference was really felt. I missed my fishing pond. I missed the breeze, I missed the sensation of victory whenever a fish was on the hook, and last I missed the time I spent there with my father. He was a busy man with long working hours but we able to spend so much time near the pond together, talked about many things. He was always there when I had a hard time facing the fish. The day after that, I spent most of my time back to the room again because for me it was a familiar place beside the fishing pond. 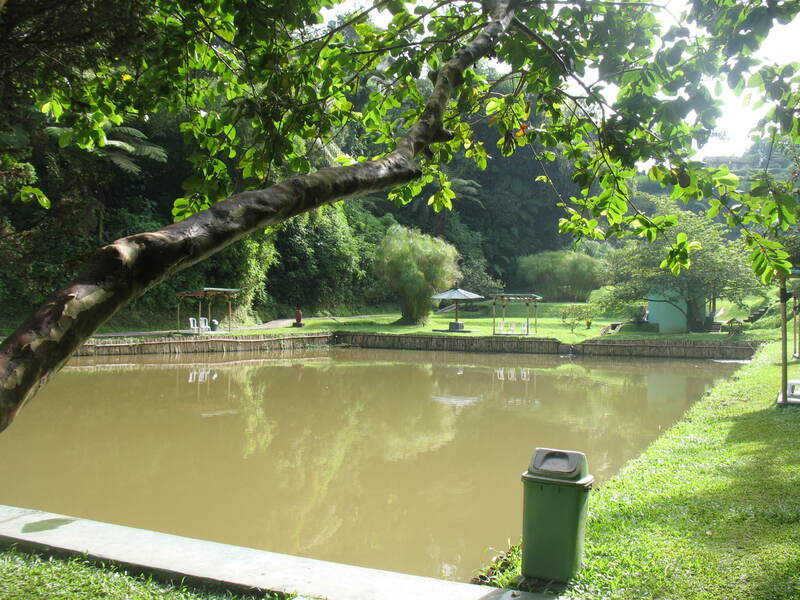 The fishing pond will always be remembered by me because, at that place, I felt closer to nature and also to my father.